Keep Your Team Connected With This Unique, Palm-Sized Two-Way Radio That is 40% Smaller and 50% Lighter Than Other Business Radios. While this MT1016 Two-Way Radio was designed for the retail, hospitality, and restaurant environments, this ultra-compact, business-class two-way radio could be used in many applications. The MT1016 redefines traditional two-way radio form by including only the essential elements needed by your team to provide better customer service, create better shopping experiences, reach higher levels of productivity, reduce errors, or simply to provide lightning-fast communication between team members. Image - sleek yet durable styling that promotes the profile and image of your business. Long Battery Life - A Lithium-Ion battery provides the power to ensure your team has communication through the entire day. For really high use applications an optional Hi-capacity battery is available. Easy to Use - one large button for easy push-to-talk operation without having to look at the radio. New Smart Status Glow feature provides visual cues for at-a-glance status information. With increased productivity of employees, the MT1016 could pay for itself in reduce staffing costs. Or it could pay for itself with the increased customer service level achieved since employees can communicate with other team members without ever leaving customers unattended. Either way you win. Smart Status Glow Color indicates active channel, radio transmit & receive, scan, and battery status. Push-To-Talk button Oversized, textured, and centrally located provides easy access. Volume Control 16 adjustable volume levels make the MT1016 easy to hear in any environment. A long press provides a quick way to lower the headset volume. 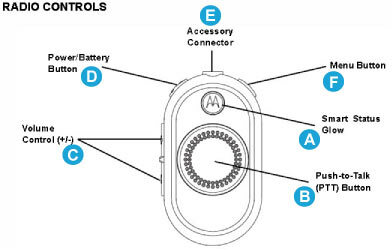 Power/Battery Button Powers device on or off, with a short press provides audio indication of current battery level. Accessory Connector Compact, durable design, for proven accessories. Menu Button Voice driven menu provides quick access to pre-programmed features: channel, monitor, scan, and call tone. These radios offer a variety of optional accessories. The included single-unit chargers are designed to be space-saving, while the multi-unit chargers handle up to six units simultaneously and provide a convenient pocket to store the earpiece. They also can be wall mounted to save counter or desk space. The standard packaged models come with standard Lithium Ion battery and the standard Lithium Ion battery door. As an option, you can order Hi-capacity Lithium Ion battery and the Hi-capacity Lithium Ion battery door. You can program or change features on your MT1016 by using the optional Computer Programming Software (CPS) and the CPS Programming Cable. CPS software is available for free as web based downloadable software, but you will be required to purchase the cable. There are a variety of headset options so no matter what your application, there's a headset that will work for you. Battery: Li-Ion batteries provide 9-14 hours** of talk and listen for service over long shifts. Power: 1-watt output with selectable high or low settings configured via CPS. Repeater Capable: Increase range and eliminate dead spots with a Motorola Repeater. Frequency Band: Operates on 99 UHF exclusive business frequencies and features 219 privacy codes. Warranty: 1 year limited warranty on product and accessories from the date of end user purchase. Voice Assisted Operation: Voice driven menu provides access to channel, monitor, scan, and call tone. Smart Status Glow: Features are associated by color, providing information at a glance. Customer Programming Software (CPS): Connect CLP to a PC with a data cable to customize your radio settings. Sleek Design: Unique palm-sized radio that is 40% smaller and 50% lighter than similar products. Embedded antenna gives it a sleek shape while increasing range of motion, and the minimized moving and protruding parts ensure it can survive heavy and demanding utilization. Audio Clear: Strong audio performance for confident communications in noisy environments. Internal Antenna: Embedded antenna delivers wide coverage in a compact design. Durability: Designed and built to withstand everyday use. Meets MILSTD 810 specifications. 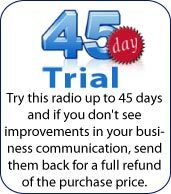 Antimicrobial Protection: Helps prevent the growth of mold and germs on the surface of the radio. Integrated Voice Solutions Capable: Enables real-time voice access among users of Motorola two-way radios, TEAM VoWLAN devices, and voice-enabled mobile computers. I am the Manager of a Medical Spa & Salon and recently purchased the Ultra Compact Two-Way Radios for my staff. They absolutely love them. No more running around trying to find service providers, and anytime someone needs help, help is a button-push away. Great product! If you're looking for the smallest, and lightest two way radio we recommend this one. One of the downsides of two way radios is that you actually have to wear them before they'll be useful. The big and bulky radios may get set down and never picked up. This one is so small and light you'll barely know it's there.